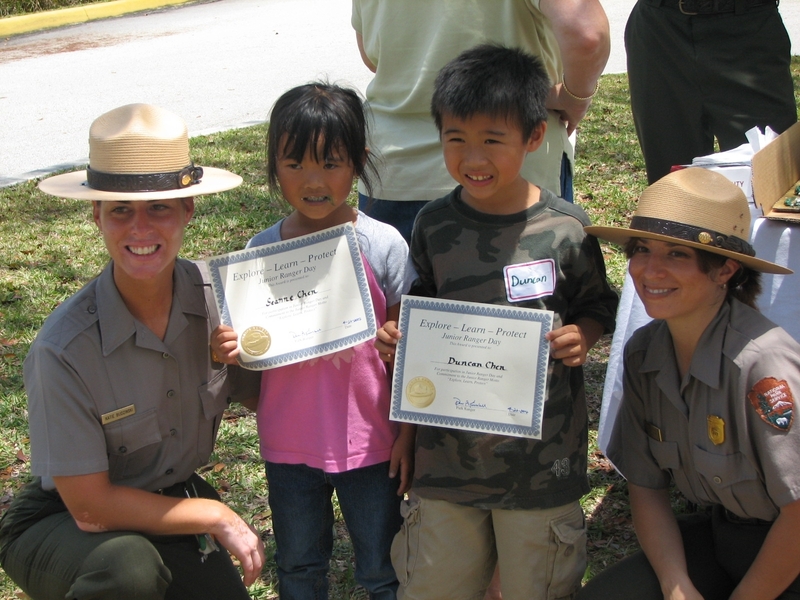 One of the best ways to experience a national park is participating in a ranger program. 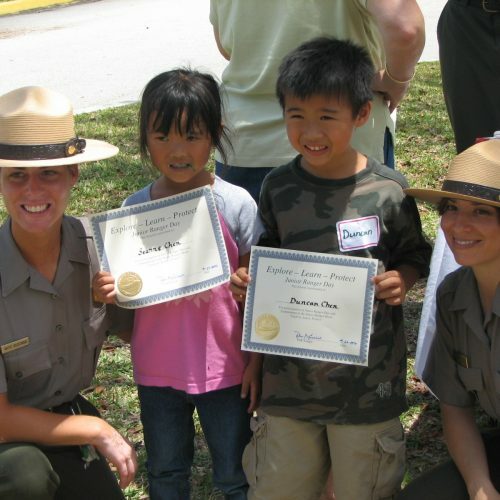 Everglades National Park offers a variety of ranger programs throughout the park, and throughout the year. 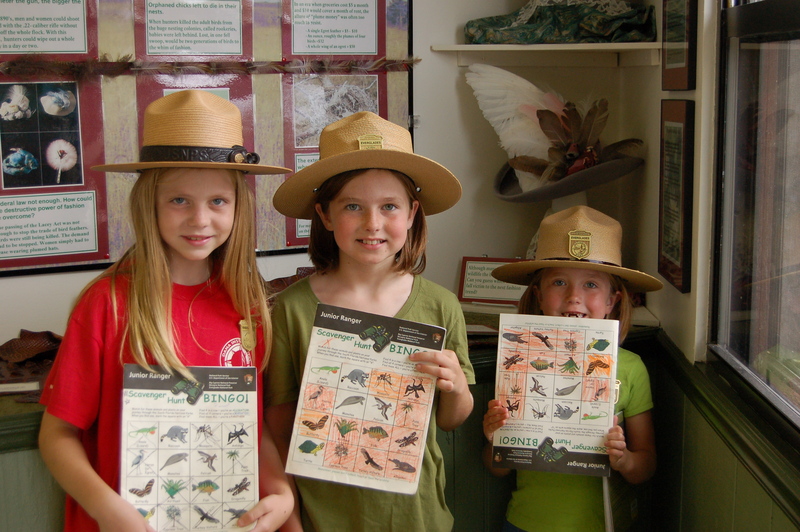 Plan your visit, pick an area and check out the types of ranger guided programs you might like! Go beyond your park visit! 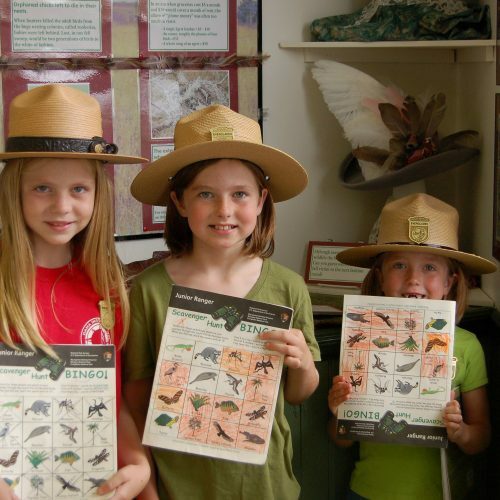 Ranger led programs are a great option to enrich your experience at national parks. 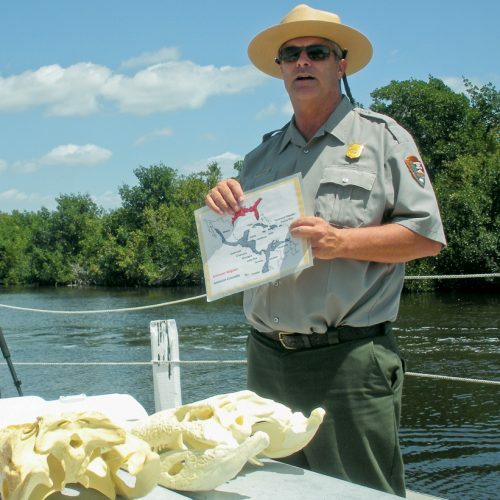 These are special programs created by Park Rangers who interpret the parks natural and cultural resources. 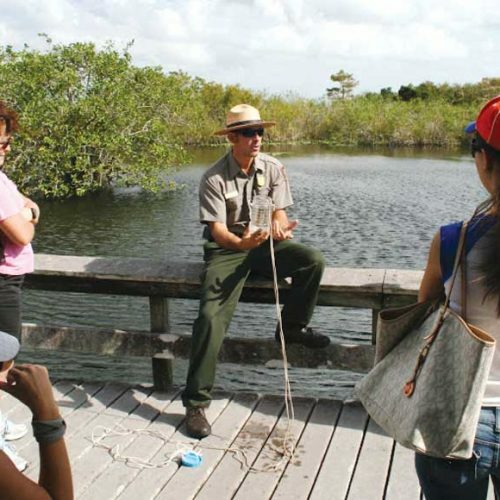 Everglades National Park increases its programs during the high visitor season (December through March), where additional seasonal rangers allow the park to provide more interpreted activities. You can also search the dates of your planned visit on the calendar for an overview the activities that will be offered throughout the park! There are three separate entrances to the park: near Homestead, near Miami, and near Everglades City. Each park entrance offers unique programs focused on its surrounding resources. Located 38 miles south down the Main Park Road after the main entrance station to the park near Homestead. From bird watching to ranger led talks, Flamingo has a variety of ranger-led activities. Flamingo offers many exciting ranger-guided tours! These programs can vary significantly by season and are subject to rescheduling or cancellation in the case of inclement weather. Check our park calendar to see scheduled programs. You can also check the current status of programs by calling the Flamingo Visitor Center at (239) 695-2945 or the main park line at (305) 242-7700. Below are summaries of all ranger-led programs available in Flamingo. Most programs are only offered in the Dry Season (November – April). Programs are free with park entrance fee unless otherwise noted. Meet at the Flamingo Visitor Center to look for birds in the area. Be prepared to walk and to drive your own car up to 30 miles round trip. Bring binoculars (if you have them) and mosquito and sun protection. Meet at the Flamingo Visitor Center for this drive to various stops along the road to experience the Everglades. Be prepared to drive your own vehicle up to 40 miles round-trip. Join a ranger at the Mahogany Hammock Parking Lot (about 18 miles past the Main Entrance to the park) for a walk into the hammock and star gazing (weather permitting). Bring mosquito protection and a flashlight. Reservations required, up to 7 days in advance. Be prepared to drive to the canoe site. Canoes are provided at no charge! For more information and to sign up for a trip, call the Flamingo Visitor Center at (239) 695-2945. Flamingo is America’s “Crocodile Capital.” Meet in front of the Flamingo Marina Store to learn about these rare reptiles, and for a chance to see the real thing! Throughout history, Flamingo has been struck by hurricanes. To learn about hurricanes and their impacts, meet a ranger in front of the Flamingo Marina Store. Flamingo is a manatee country. Meet in front of the Flamingo Marina Store for a talk about these marine mammals and a chance to see one in person! Stop by the Flamingo Marina any time between 1:30 and 3:30, on designated dates, to marvel at this diverse collection of natural history paraphernalia. Get past the hype to learn the real story about pythons in the Everglades! Meet in front of the Flamingo Marina Store. Take an easy stroll to learn about Flamingo’s Caribbean plants and trees. Meet at the Flamingo Visitor Center. Located 4.75 miles south of US 41- Tamiami Trail on State Road 29 in Everglades City. Explore the wilderness waterway by canoe or boat tour. Nature walks are also offered at this location. 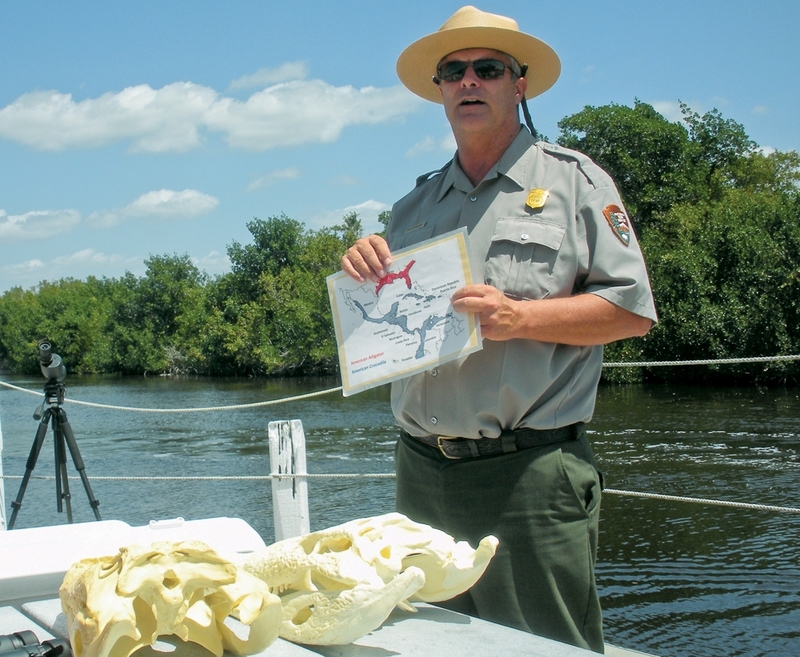 Gulf Coast offers many exciting ranger-guided tours! These programs can vary significantly by season and are subject to rescheduling or cancellation in the case of inclement weather. Check our park calendar to see scheduled programs. You can also check the current status of programs by calling the Gulf Coast Visitor Center at (239) 695-3311 or the main park line at (305) 242-7700. Here is a summary of all ranger-led programs available at Gulf Coast. Most programs are offered in the Dry Season (November – April). Programs are free unless otherwise noted. Are you new to fishing or just want to get a refresher? Join the rangers to learn about the saltwater fish of SW Florida, how to identify fish, how to cast, and how to throw a cast nest. Fun for all ages. Help Everglades National Park celebrate Calusa Days by learning about the 10,000 Islands! Come to discover how these fascinating islands have shaped many lives. Expect engaging outdoor demonstrations, exciting activities, riveting storytelling, and thought-provoking programs. Check the park calendar for this annual special event’s times and dates. How did anyone survive in the harsh mangrove ecosystem? Come by and see first-hand what techniques people sued to not only survive but flourish, in this unforgiving landscape. Fun for all ages. Learn about the plants and animals of the area. Meet park staff at the picnic pavilion in an easy walk that last around one hour. Experienced paddlers can join a ranger to explore the Ten Thousand Islands to look at wildlife and mangroves and learn about the park’s natural and cultural history. If tide and weather allow, the trip may include a short walk on an island. Canoes are provided free of charge. Paddling skills and the ability to independently swim are necessary. Call the Gulf Coast Visitor Center for additional program details and to make a required advanced reservation. Reservations can be made starting 14 days in advance and by calling (239) 695-3311. The best part of the Everglades is off the main road! For those that want to do and see it all, join a ranger-led all day trip through some of the highlights of South Florida. 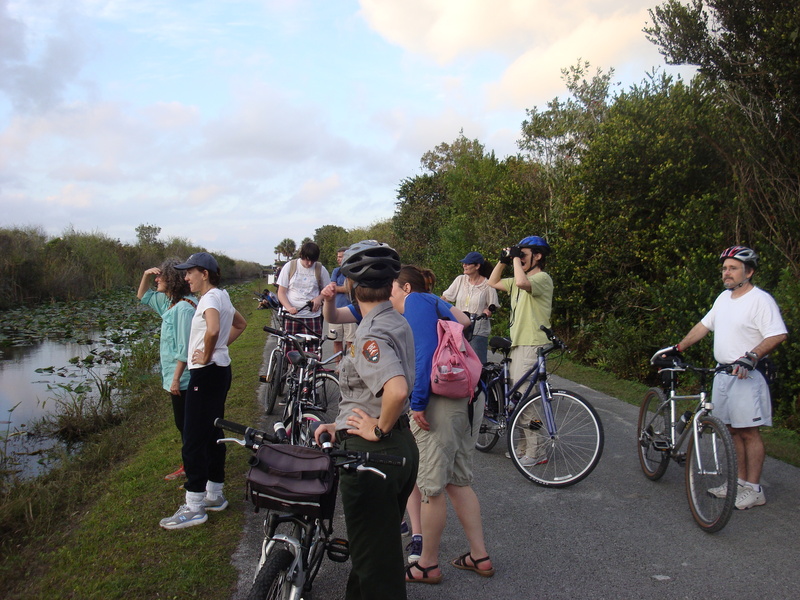 The day will start at the Gulf Coast with a canoe trip in the mangrove estuary, followed by a hike through Big Cypress and then finish with a bike ride through the sawgrass prairie at Shark Valley. Be prepared with plenty of water, food, and protection from the elements! Canoes will be provided free of charge. Bring your own bicycle or rent one at Shark Valley. Call (239) 695-3311 to make reservations up to 14 days in advance. Boat tours of the Ten-Thousand Islands depart from the Gulf Coast Visitor Center in Everglades City, FL. Tours operate every day, year-round. Boat tour tickets can be purchased in person at the temporary concessioner location at 905 S. Copeland Ave. Everglades City, FL 34139. Tours leave from the Gulf Coast marina, across the street from the concessioner, where parking is available to the public. For reservations, prices and hours, call 239-695-0100 or visit their website. 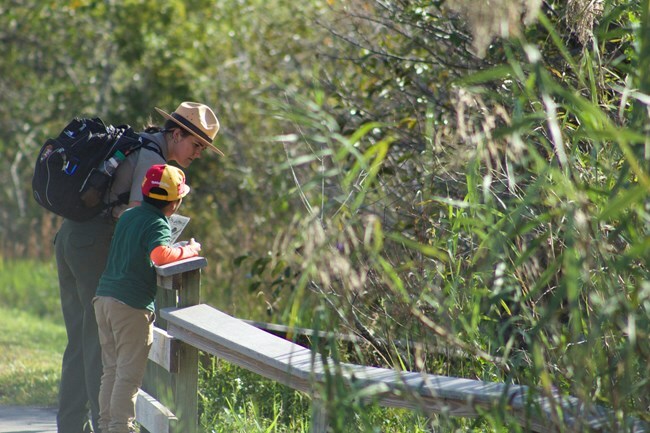 Located about 4 miles after the main entrance station to the park near Homestead.From bike hikes to slough slogs, Royal Palm always has an adventure waiting for you! Royal Palm and surrounding areas offer many exciting ranger-guided tours! These programs can vary significantly by season and are subject to rescheduling or cancellation in the case of inclement weather. Check our park calendar to see scheduled programs. You can also check the current status of programs by calling the main park line at (305) 242-7700. Below are the summaries of all ranger-led programs available in Royal Palm and other areas nearby. Most programs are only offered in the Dry Season (November – April). Programs are free with park entrance fee unless otherwise noted. Year-round Programs: The Anhinga Amble and Glades Glimpse are offered every day, year-round, including during the summer months! Interested in seeing wildlife? 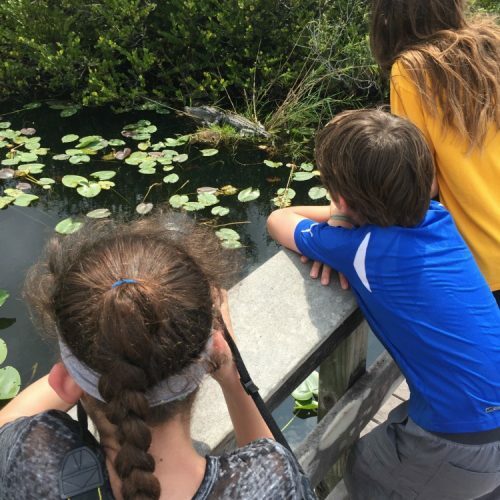 Take a stroll and explore the renowned Anhinga Trail where alligators, wading birds, and other wildlife are easily spotted! Meet at the Royal Palm benches. Wheelchair accessible. 0.7 miles, 50 minutes. Available every day, 365 days a year! Treffen wir uns an den Bänken von Royal Palm für einen Spaziergang zu Alligatoren, Anhingas, Reihern und vielem mehr! Jeden Mittwoch um 11 Uhr. Reservations required. 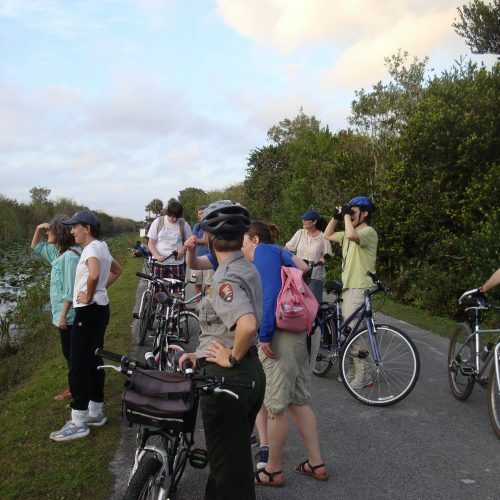 Explore the unique wilderness of the Everglades by bicycle! Bikes, helmets, and water provided. Stop by the Ernest F. Coe Visitor Center or call (305) 242-7700 for reservations (ages 12 and up) 5 to 10 miles, 2.5 hours. Strenuous. 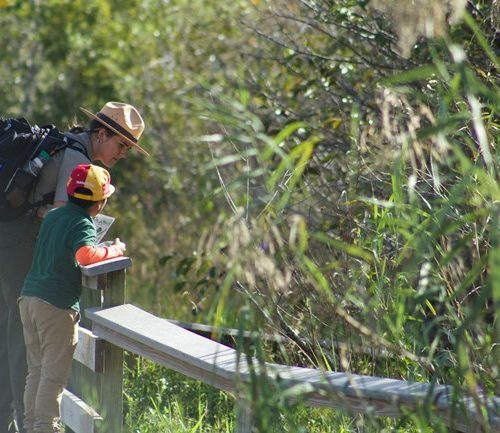 Join a park ranger for this illustrated program focusing on the unique natural or cultural wonders of the Everglades. Check bulletin boards and visitor centers for program topics. Meet at Long Pine Key Campground Amphitheater. Accessible. 45 minutes. The Everglades is a place like no other! 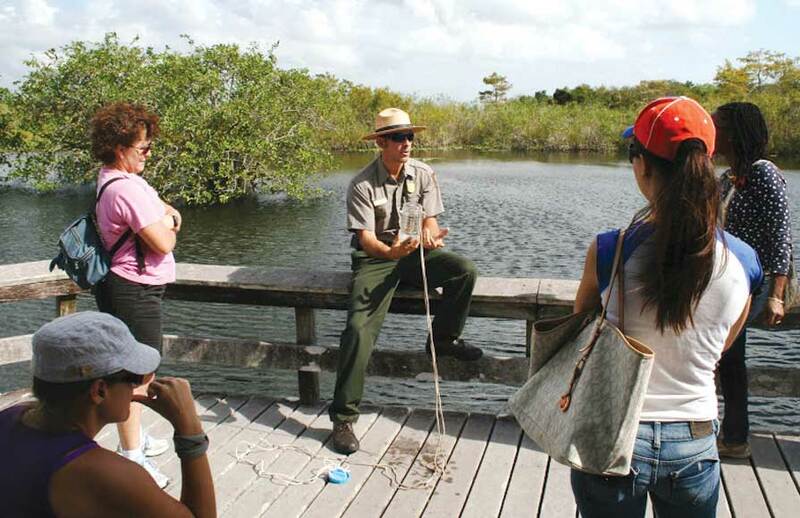 Sit in the shade as a ranger reveals the fantastic wonders of the Everglades. Topics vary daily. Meet at the Royal Palm benches. Accessible. 20 minutes. Available every day, 365 days a year! Step into the Cold War for a tour of the historic Nike Missile Site A/2/52 where U.S. Army soldiers defended the Nation from the threat of attack. Meet at the Daniel Beard Center. Accessible, 0.7 miles, 1.5 hours. 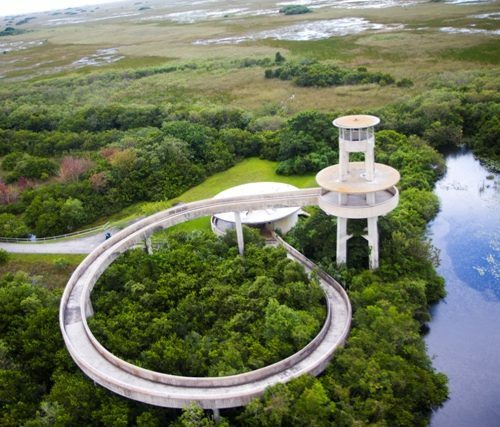 Wade through the River of Grass into the shadows of a “gator hole” or a cypress dome. Wear lace-up shoes, socks and long pants that can get wet or muddy. Call (305) 242-7700 or stop by the Ernest F. Coe Visitor Center for reservations, up to one week in advance (12 and up), 1 to 2 miles, 2 hours. Strenuous. Experience the Anhinga Trail by starlight! The night is just as busy as day; listen for pig frogs, look for fireflies and gator eyes! Meet at the Royal Palm benches. Flashlight optional. Accessible, 0.7 miles, 45 minutes. Shark Valley offers many exciting ranger-guided tours! These programs can vary significantly by season and are subject to rescheduling or cancellation in the case of inclement weather. Check our park calendar to see scheduled programs. You can also check the current status of programs by calling the Shark Valley Visitor Center (305) 221-8776 or the main park line at (305) 242-7700. Below are summaries of all ranger-led programs available at Shark Valley. Most programs are only offered in the Dry Season (November – April). Programs are free with park entrance fee unless otherwise noted. Join a park ranger or volunteer for a stroll around Shark Valley. 45 minutes. Wheelchair accessible. Meet at the viewing platform. The Everglades story is a complex tale of plants, animals, water, and history. Join us for a short talk and get an in-depth glimpse of the Everglades. Meet at the benches near the viewing platform. 30 minutes. Wheelchair accessible. Want to try something different? How about “off-roading”? Want to test yourself against the Everglades in the summer? A park ranger or volunteer will lead you through Shark River Slough using your feet as your “wheels” for a great adventure! Be prepared for high water levels, insects, and mosquitoes. Reservations are required, and children must be at least 12 years old. Call 305-221-8776 for more information. 2 hours. Join a ranger as you hike through the trails of Shark Valley at night and learn about the ecosystems of the Everglades along with the human history. Reservations will be taken 1-week before the walk. Call 305-221-8776 for reservations. Join a ranger for a car caravan trip to the L-67 Canal, approximately 5 miles to the east of the Shark Valley entrance. This is the old eastern boundary of the park. The bike tour will lead you down the canal berm on an unpaved, gravel road. Explore the wildlife along the canal and the magnificent views of the eastern portion of Shark Valley Slough and the Everglades. Meet near entrance gate at Shark Valley, car caravan to the L67 lot, five miles east of Shark Valley. Reservations are required one week in advance to the scheduled ride. For more information, call 305-221-8776. Approximately 3 hours. Bring your own bicycle. Explore the subtleness of the wetlands as the morning light wakes up its inhabitants, birds, turtles, and alligators sunning themselves along your path. Join a park ranger or volunteer for a 15-mile bike ride out into Shark River Slough. Bring your own bicycle or rent one from the concession. Meet on the back side of the visitor center by the benches. Approximately 3 hours. Watch a fantastic meteor shower over the sawgrass prairie. Listen to the accompanying Everglades “night symphony” as you get a glimpse of a meteor shower arching across the night sky. 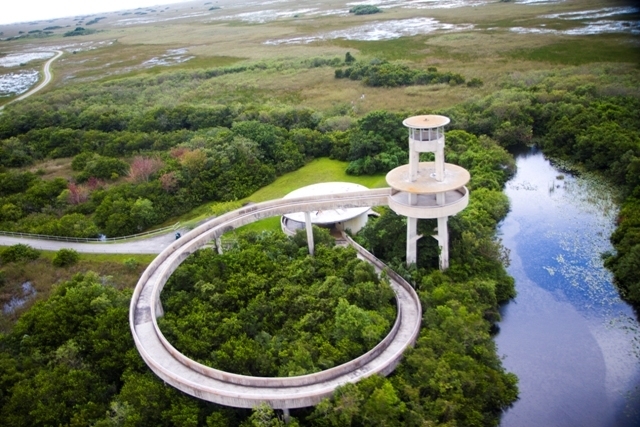 Climb the observation tower to enjoy the mystery and feel the magic of the Everglades wilderness at night. Join a park ranger for an evening 15-mile bike ride. Bring your own bicycle. Reservations required one week in advance. For more information call 305-221-8776. Find yourself immersed in the “River of Grass,” the very heart of the Everglades. Chances to see alligators, wading birds, and other wildlife in their natural habitat abounds. Narrated by a park ranger or park naturalist. For reservations, pricing, and additional information call (305) 221-8455. Reservations recommended.